The mood set by this CD must be considered the quiet after the lightning struck. The calypso and soca tunes from Melanie, Crazy, Kitch, Colin Lucas, and Anselm Douglas barely increase the tempo beyond the lullaby-like pace of Miriam Makeba's The Lion Sleeps Tonight. Listen to the fourteen tracks and you hear jazz standards from Ellington, Gillespie, Monk and Parker. You also get a taste of Hammerstein and Clapton/Marley. Some of them command you to listen repeatedly: I obeyed The Lion..., I Shot the Sheriff and Mystery Band and each time imagining I was at a pan jazz concert with guest appearances by Marley, Kitchener and Makeba. 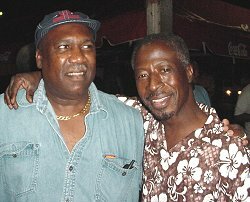 Clyde "Lightning" George was born in the same place, at the same time, as the steel pan. Both shared humble beginnings in the hills of Laventille overlooking Port of Spain, the capital city of Trinidad. By the age of 9, Lightning was a regular at the neighborhood panyard. It was here that Bertie Marshall, the inventor of the double tenor pan and leader of Highlanders Steel Orchestra, gave Clyde his nickname "Lightning" because he was so quick to learn the music. These two pan pioneers continue to bring this joyful instrument, from its unlikely island origins, to the Carnegie Halls of the world. 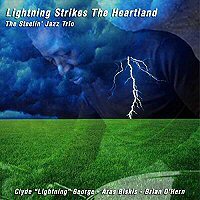 As "Lightning Strikes The Heartland" demonstrates, Lightning has spent his life between the jazz clubs of Chicago and the panyards of Trinidad. To that point, Dave Hoekstra, music critic of the Chicago Sun Times, wrote "Lightning effortlessly weaves a gentle calypso beat between the hard-bitten notes of the jazzmen. Calypso and jazz are an unusual blend, but then Lightning is a free bird and one of a handful of panmen who uses 3 or 4 sticks while playing which adds to his quickness. "The Steelin' Jazz Trio came together in the Chicago jazz scene. Aras Biskis and Brian O'Hern hold jazz music degrees from the Berklee School of Music in Boston. They have traveled with Lightning to his homeland of Trinidad to better understand the music of this magical island. Together, this trio creates an original style and bring a fresh sound to the wonderful classics in both musical worlds.